Mark Bodanza recounts this dramatic year both on and off the field of the professional and college gridirons and analyzes it in the context of the times. He tells the story of a momentous season shared by the high schools of Fitchburg and Leominster, Massachusetts, a rivalry dating back to 1894. In the prior thirty-nine seasons, the teams had played each other forty-nine times. But, 1933 was different; the game had never had such significance. More than ever, Depression-wary Americans needed a reprieve from their cares and concerns. Football provided a welcome relief. 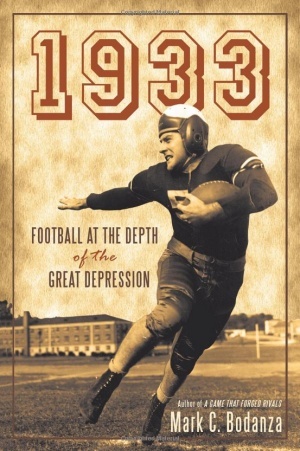 Including period photos, 1933 narrates how the sport of football-which has created some of the nation’s most magical moments in sports-was impacted by the Great Depression in a variety of ways, some with lasting consequences.